We appreciate you coming to our website and using our data. Our mission is to provide timely, reliable data on offshore renewable energy projects across the world. The National Ocean Economics Program wishes that groups will use these data to demonstrate trends in movements toward offshore renewable sources of energy. Offshore Renewable Energy refers to the generation of electricity from ocean-based resources. These include wind turbines located offshore in the oceans and Great Lakes and marine based energy sources including waves, tides, and salinity and thermal properties. Marine based projects are considered “offshore” if they employ ocean resources. For instance, a tidal generator located at a river’s mouth is considered offshore since it uses the flow of the ocean tides. 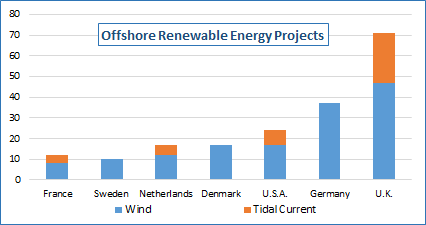 The NOEP offshore renewable energy database has been completely updated with projects in the U.S. and Europe. A new database search facility has been produced to help in locating projects by generation type (wind or titdal-current), development stage, current or projected capacity, or country and region. For more information regarding the contents of our database, please see our Offshore Renewable Energy Data Code Book. We appreciate any indications/updates to our data or notification if you encounter a problem with them. Please send updates to: NOEP@OceanEconomics.org and we will update the database promptly after verification. We thank you for coming to NOEP’s database on offshore renewable energy. We look forward to serving your information needs as we update our database.